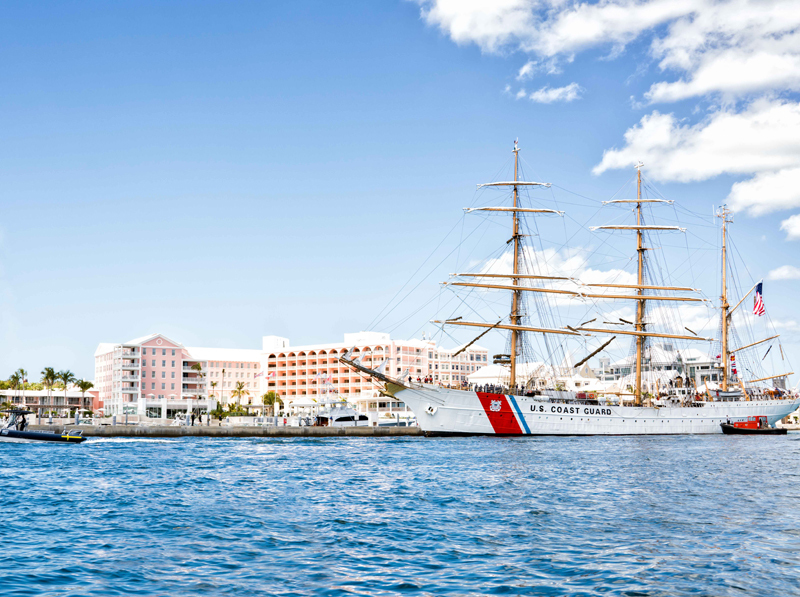 NBC’s Today show co-hosts Kathie Lee Gifford and Hoda Kotb are set to broadcast their U.S. morning show from Bermuda tomorrow [May 18], and the US Coast Guard Cutter Eagle has arrived at the Hamilton Princess in advance of the filming, where it will serve as part of the backdrop during the live broadcast on Thursday. 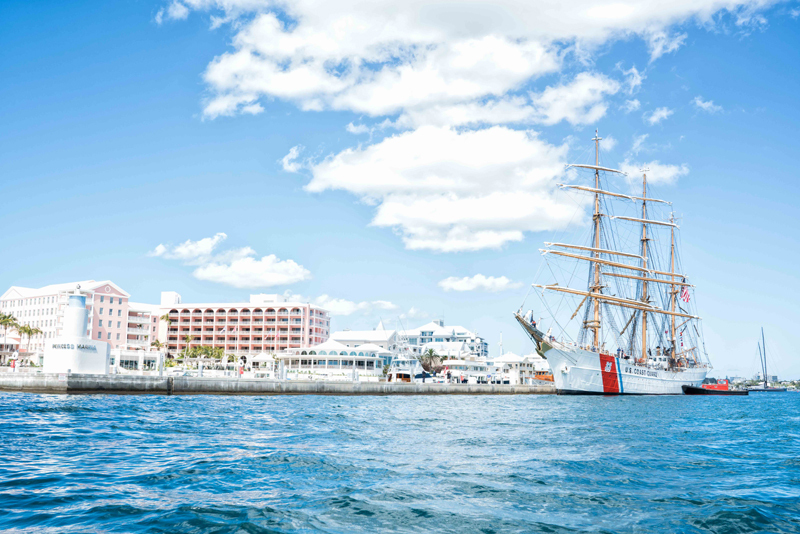 The show will be live to air from the Hamilton Princess, and the Eagle — a tall ship who had already planned to be in Bermuda around this time — adjusted her schedule slightly to accommodate this opportunity with the well known American morning television programme. Kathie Lee and Hoda will shoot two one-hour shows in Bermuda for the 10am EST slot of the Today show; the first will broadcast live on Thursday, May 18th, and a second taped show will be shot on Thursday to air on Friday, May 19th. Great to see Bermuda is shining LOUD AND PROUD. Thank you BTA and OBA.This will be televised to millions of households.Priceless. Had nothing to do with them. Stop being a Troll. Sorry it must have Jamal Simmons. No need to thank the OBA and the BTA. They had absolutely nothing to do with this. But knowing the BTA they will lay claim to it, pat themselves on the back and pay themselves large bonuses. You do realize the BTA are the ones that actually brought the Today show to Bermuda right? Seriously, they did. I think that NBC and the Eagle are here because of the AC which was an OBA initiative. I could be wrong….. They had nothing to do with it? So who is responsible for all of this then may I ask? Are you saying all of this activity and excitement just spontaneously happened? Good old Bermudian luck? Jobs for Bermudians should come first. The 2,000 jobs promised must have gone to all outside workers. What about Bermudians? Jobs should be oba’s priority but it is not. Democracy under oba IS DEAD!! You are right…who you gonna call? Global hue badada… dada… ddddada. Tourism creates jobs for crying out loud, where did you study economics you political minion? The same thing you will babble about after the election. Wait and see! If you’re out of work, why? there are thousands of jobs here for those who want them. Seriously Betty/Backbone/Lavern, do you ever give it a rest? Trolling is a full time job for you. I hope you get compensated well and they give you good insurance as levels of negativity as high as yours have been shown to cause serious illnesses…cancer even. Take a day or two off for your health, mental and otherwise. Don’t waste your time replying as I actually have a life. Oh, and I’m going to be busy watching Hoda and Kathie Lee showcase our awesome island home to millions of people around the globe! Exciting times in Bermuda! Have some backbone- you are spineless!! You trot out some tired lines – go away you propagandist nationalist!